Where can you get complete and balanced nutrition combined with a great taste? It's really easy, just grab an Activlab High Whey Protein Bar! The High Whey Protein Bar is specifically made for active people who live fast-paced lifestyles. Each bar is packed with the right nutrients your body needs for staying active, healthy and anabolic. The High Whey Protein Bar's nutritional content is so complete that it can actually replace a full meal – perfect for those times when you are on the go and have no access to a complete meal. Each High Whey Protein Bar gives you 19.2g of protein to help you build and maintain lean muscle. High Whey Protein Bar is an excellent source of BCAAs (Branched Chain Amino Acids) which trigger protein synthesis, reduces muscle fatigue and provide additional energy for your body. You also get fast-acting carbohydrates (Glucose and Fructose) which will provide you energy to complete all your daily activities, both at work and play. These carbohydrates are perfect for re-filling your depleted energy reserves quickly. 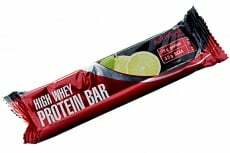 But to make things even better, the High Whey Protein Bar is designed to taste phenomenal – one of the few protein bars that will impress you with each bite! Invest and try just one Activlab High Whey Protein bar, and next time you will want a full box! Have a question about High Whey Protein Bar? What is it, what does it do, how and when to use or something else? Ask us. “High Whey Protein Bar 24X 44g” is currently out of stock. Enter your details below and we will let you know when it's back in stock. PLEASE NOTE: Nutrition facts per 100 grams. Vitamins are 35% of recommended daily allowance (RDA). ALLERGEN INFORMATION: Contains gluten, soya and milk. May contain: eggs, peanuts and other nuts. Recommended dosage: As required depending on the dietary regimen followed, and daily protein demand. Way of use: Once opened, the product must be consumed immediately.